After 14 years, finally this fantastic family of superheroes movie got its deserved sequel. I honestly cannot remember where exactly I saw this one as it has been so long ago, but I did remember that it was quite awesome, rather heavy and touching. So when I found out about the planned sequel which was going to be released in summer 2018, I have already set my mind to make sure I did not miss out on this movie. Today, as my office was given an off day, my wife and I went out to new coffee shops and continue to Gandaria City mall which was nearby those places. Thanks to 1 of her friends, we could use cinema vouchers from him in the IMAX studio. Without further ado, here is more on the movie. The Parr family consisted of Bob/Mr. Incredible (Craig T. Nelson - Poltergeist, Coach TV series etc) with his wife Helen/Elastigirl (Holly Hunter - The Piano, The Big Sick etc) and their children Violet (Sarah Vowell), Dash (Huck Milner) and baby Jack Jack were a family of superheroes and wanted to fight & help people in need. However, the world could no longer accept the existence of superheroes and they were forced to stop what they were doing, especially when their last battle with a supervillain resulted to a huge damage to the city. But when a rich guy named Winston (Bob Odenkirk - The Post, Breaking Bad TV series etc) and his sister Evelyn (Catherine Keener - Being John Malkovich, The 40 Year Old Virgin etc) offered Bob, Helen and their best friend Lucius aka Frozone (Samuel L. Jackson - so many films to his credit) the chance to show the world why superheroes are still needed, they could not resist the proposal. There was only 1 catch though, that is the best hero to turn that image around would be Elastigirl. Which would mean, Bob had to take care of the children while Elastigirl fighting various crimes. Things were not so easy for Elastigirl either especially when there was a mysterious bad guy who called himself the Screenslaver trying to sabotage her works. So could Elastigirl change the perception of all the people? And could Bob take over the "mother" role while he himself wanted so much to be the one doing all the superhero stuff? Find them all in this fun & exciting superhero family movie. Well this was a wonderful family movie. 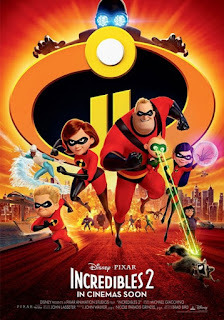 Just like its predecessor The Incredibles, this one also put emphasis on the value of family. The film was not just an ordinary superhero movie but it was also a family drama complete with the problems a family would have such as Violet's adolescent problem, Dash' difficulty in learning and of course handling a baby who has super powers. Not to mention the challenges a father would have when his wife was the one providing for the family. These are only some of the things which made me feel the movie was not as light as people would have thought. As an animated movie, this one was done very well (should be when it was produced by the studio that brought to us beautiful movies such as Toy Story series, Finding Nemo & its sequel Finding Dory or who could forget Coco?). The drawings of the characters' faces were great and we could picture the people's actual looks would be like those, especially Bob and Lucius. My wife was particularly amazed with Helen's animation as even her lips were made to look like her way of speaking. I believe that this could also made possible by the awesome voice characterization by the wonderful actors and actresses. In this sequel, the whole family's voices were done by the same people from the original movie. There was also the very funny character of Edna (portrayed by the director of this movie himself Brad Bird) that was quite memorable from the first movie. And there were additional new superhero characters with the most notable one called Voyd voiced by Sophia Bush - John Tucker Must Die, Chicago P.D TV series etc. Another well known actress who provided her voice here was Isabella Rossellini as the Ambassador. Btw, I have mentioned above that I saw this in IMAX theater and I think it was good, but it did not seem to make a lot of difference from normal studio. Not sure why coz I noticed during the end credit part (which did not have any middle or post scene), the movie was formatted for IMAX. The sound effects were good but not spectacular. The music, especially songs of Mr. Incredible, Elastigirl and Frozone during that end credit scene were made like it came from the 1970s which was a nice touch by the filmmaker. Overall this movie was entertaining. There were plenty of funny moments involving the baby Jack Jack or Bob's difficulties in handling children's problems. The action part were quite thrilling and suspenseful, with the finale part making an awesome climax. Movie was classified for all ages, which I personally feel quite suitable. Aside from some serious moment and discussions in the early part of the movie, the rest of them seemed easy enough for the younger children to understand and have fun. And 1 thing that really really must be avoided is to be late coming to the studio. There was a very lovely short movie from Pixar titled Bao (referring to a type of filled bun dumpling in Chinese cuisine). It was such a touching film that really affected my wife and me. So if you like the original 2004 movie, then you would definitely be able to enjoy this. My wife felt this one was even better than the predecessor, but for me both were equally good. Anyway, be sure to see this one in the cinemas with your family and friends.